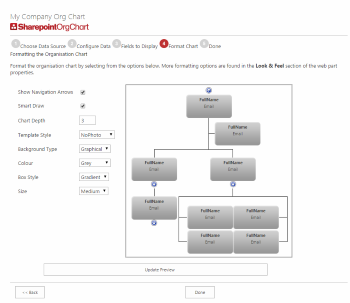 SharePointOrgChart can create organization charts from CSV files. These files can be loaded from a file share across the network, from directory on accessible to the local server or from a SharePoint document library. 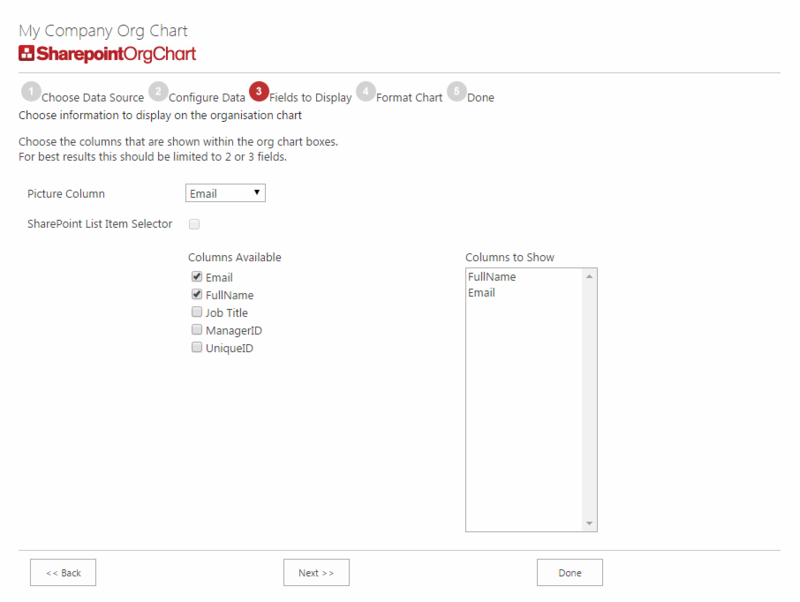 In this guide we create a chart from this file. 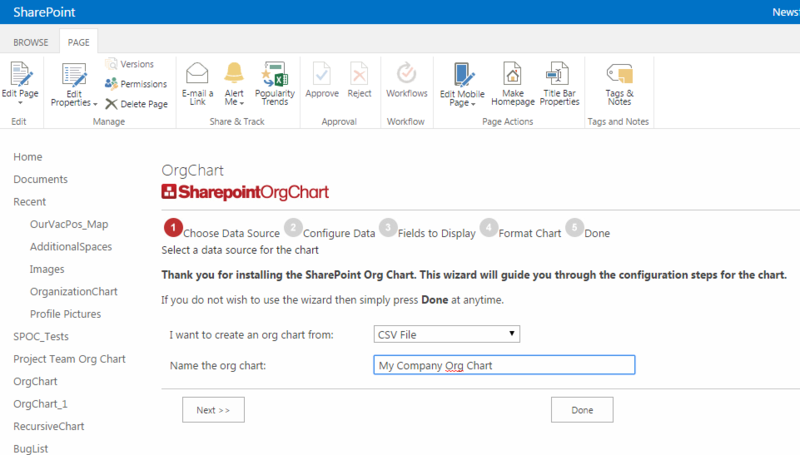 Add a SharePointOrgChart web part to a SharePoint page. Enter the path to the CSV file into File Path text box. The file must be accessible by each WFE or application server and the path can be either a file share, directory path or HTTP address of a file. Are all valid file paths. If the file has headers then leave the Has Header Row option checked. If the file does not have headers then each column will be assigned a name automatically. Once the path has been entered press the Read File button. This will check that the file is accessible from the SharePoint server. Finally choose a column that represents the Primary Key, in the example file this is the UniqueID column and the column that represents the Manager, in the example this is the ManagerID column. Then press Next to move to the next stage. In the next step the page author can select the columns that they wish to display in the chart boxes. For best use of the space it is advisable to limit these to two or three columns. 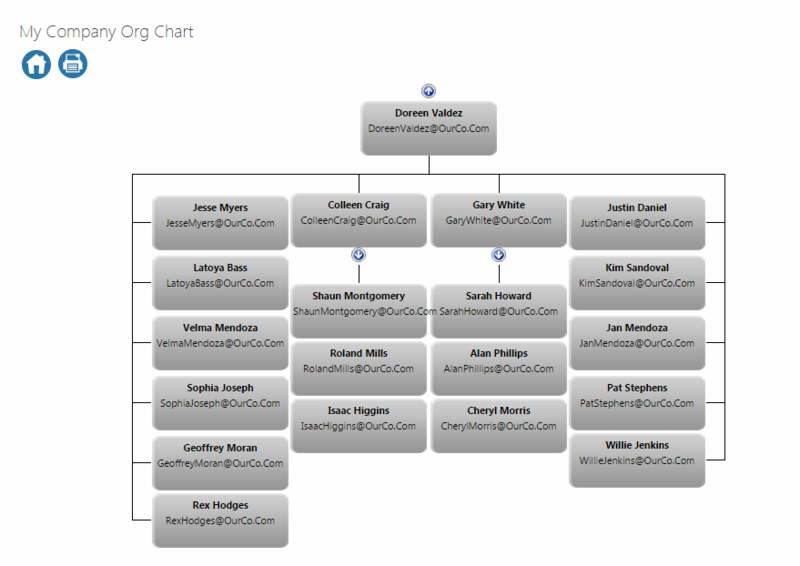 In this example the FullName and Email columns have been chosen from the file. In the final stage the page author applies some styling to the chart. Because the is no URL to a picture within the example file the Template Style is set to No Photo. The Chart Depth has also been set to 3. The configuration is now complete and the chart can be viewed, searched and navigated. The Data Source - CSV File configuration section contains further configuration settings, for example the Delimiter used within the files and column name mappings.